The Village Church’s 7th Annual Women’s Clothing Swap is happening this Friday! 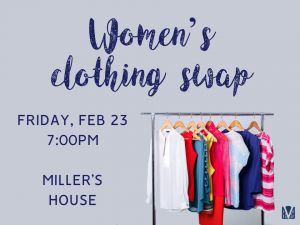 Bring old clothes and swap them out for clothes that are “new to you.” We will be meeting at the Miller’s house, and you can RSVP at this Evite. Contact Ashley (ashley.lapointe@gmail.com) or Kari (miller101610@gmail.com) for details.